Vancouver, Canada – Mawson Resources Limited (“Mawson”) or (the “Company”) (TSX:MAW) (Frankfurt:MXR) (PINKSHEETS: MWSNF) announces the Company has been granted the 2,123 hectare Männistö Exploration Permit at the Rompas-Rajapalot gold project in Finland. The Männistö permit includes both the Rompas high grade nuggety gold mineralization and areas prospective for Rajapalot-style disseminated gold. The granting is noteworthy, as it allows Mawson to restart exploration at the Rompas prospect after a 4-year hiatus. 1 metre @ 114.5 g/t gold from 44.0 metres from drill hole ROM0014. A reverse circulation (“RC”) drill rig has now been mobilized (Figure 3). 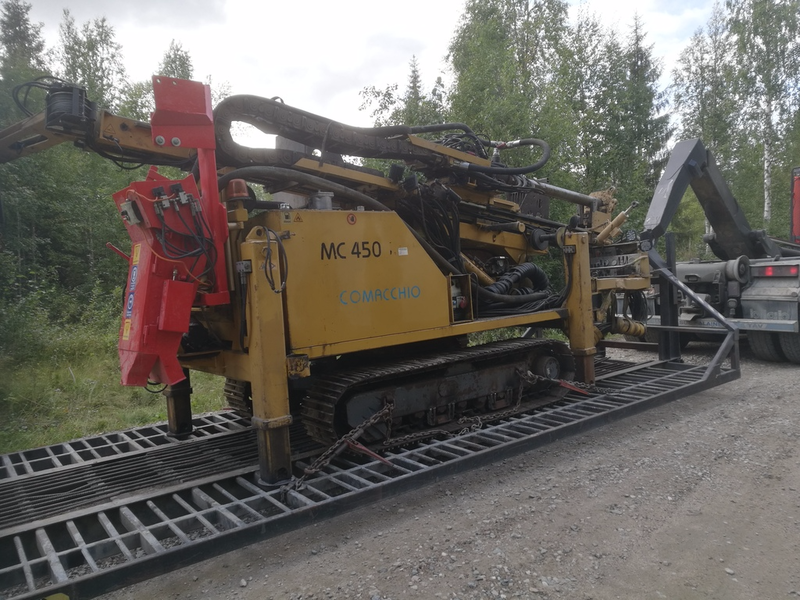 Twenty shallow holes (5-10 metre) will be drilled through thin glacial soil to bedrock along 3 lines to test the Rajapalot-style gold target position. Targets identified will immediately be followed up with diamond drilling. The principal target at Männistö is Rajapalot-style disseminated gold mineralization hosted within metasediments that surround the Rompas vein-hosted gold system. 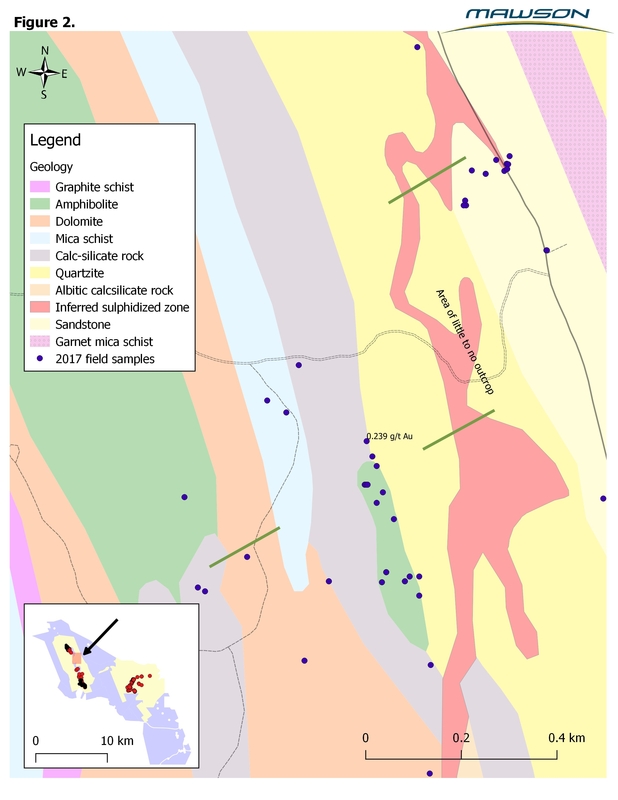 This style includes the numerous significant drill intersections of the Palokas prospect which lies 8 kilometres east of Rompas (ie PAL0030: 10.0 metres @ 11.6 g/t gold from 110.2 metres; PAL0027: 6.8 metres @ 14.7 g/t gold from 34.4 metres and PAL0075: 27.0 metres @ 3.3 g/t gold see Mawson Press Releases July 05, 2017). Nuggety gold mineralization at Rompas occurs in deformed calc-silicate veins hosted within a mafic volcanic, while disseminated gold mineralization of the Rajapalot-style is typically hosted within albitic- or Mg-calcsilicate-rich metasediments. Field mapping, prospecting and 8.1 kilometres of VLFR geophysical surveys have been completed over the last 2 months, which has defined a Rajapalot-style target horizon extending for 2.5 kilometres along strike. VLFR or Very Low Frequency Resistivity electromagnetics is a ground probing technology that utilizes VLF signals in the 15 to 30 kHz range. The method is an inexpensive means to collect high quality bedrock data, and is having a revival due to both technology improvements and software developments. 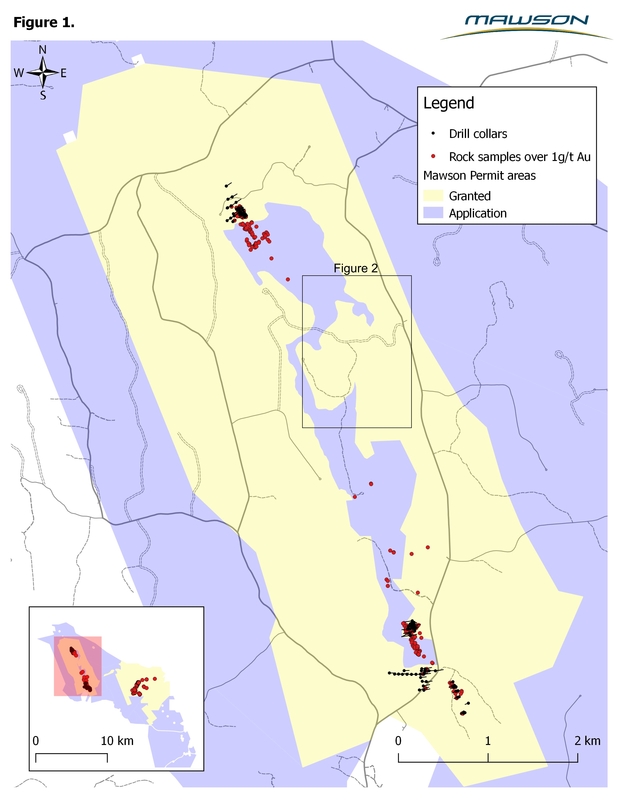 Assay results showed one sample in outcrop adjacent to the conductive and interpreted target zone to assay 0.24 g/t gold in an area of predominantly thin glacial soil cover (Figure 1), adding to the prospectivity of this trend. PGN Geoscience, an expert in the building of 3D structural-geophysical models, and Dr. Nick Oliver of Holcombe Coughlin Oliver Valenta Global, a renowned Proterozoic structural and hydrothermal specialist. A significant drilling program will resume at Rajapalot in late 2017/early 2018 when winter conditions allow access. Analytical samples were transported by commercial transport to ALS Chemex Ltd's laboratories in Sodankylä, Finland. Samples were prepared at Sodankylä and sent to ALS Loughrea located at Dublin Road, Loughrea, Co. Galway, Ireland to be analyzed by Au-ICP21, GRA-21, ME-MS41u and ME-MS61u techniques. The QA/QC program of Mawson consists of the systematic insertion of certified standards of known gold content, with blanks at the beginning of each batch. In addition, ALS Chemex inserts a number of blanks and standards into the analytical process. with Rompas to the west (left) and Rajapalot to the right (east). to the right (east), with mapped area shown by orange box.